* One of the Most Desirable Locations in Whistler! WELCOME to the Gables - A peaceful complex in a prime location. 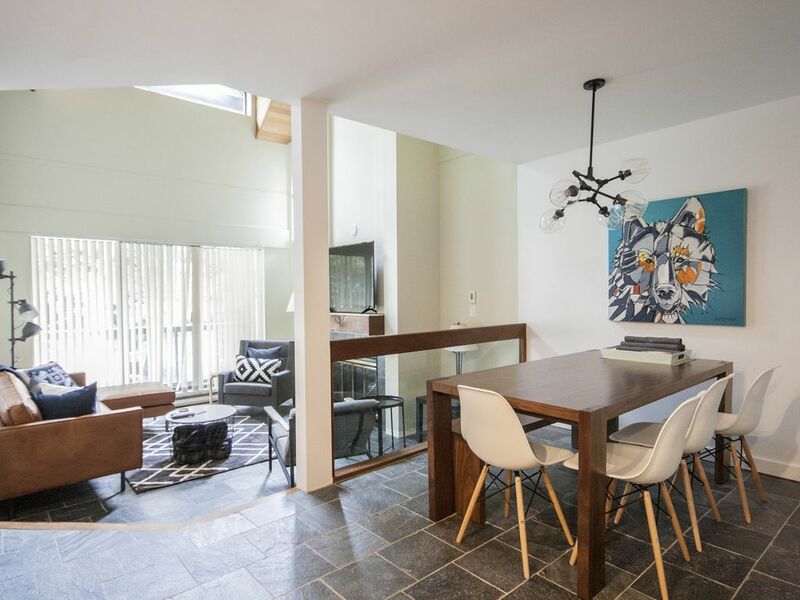 Arrive home to this beautiful townhome after a day exploring Whistler just steps both the main village, upper village and both Whistler and Blackcomb mountain. You will be close to shopping, dining and entertainment. The beautiful Fitzsimmons creek is right next to the complex with a large green space offering you tranquility in the center of it all! In the Summer the Family Adventure Zone is takes place in the Upper Village only a few minutes' walk away, where there are tons of children's activities such as bungee trampolines, mini golf, go carts, mazes, batting cages and so much more! The Whistler Farmers market is also held here every Wednesday and Sunday. Lakes and trails are all nearby. The Chateau Whistler Golf course is also just around the corner as well as Lost Lake and lots of XC biking and hiking trails! You can be at the world famous bike park on Whistler in seconds. There is also plenty of other activities including ziplining, ATV tours and white water rafting. The outdoor concert series is another highlight of summer as well as a growing list of events. During the Winter, you can be out of your door and sitting on the gondola within a few minutes, ready for a day of exploring the epic mountain terrain Whistler offers. Gables is located a few minutes walk to both Whistler or Blackcomb base / All three gondolas are on your doorstep. The Lost Lake cross country ski and snowshoe trails are not far away. After a long day of adventure - stroll to your door, hang up your ski's in the mud room and curl up by the wood burning fireplace while watching the snow fall outside your window in this beautiful forested area. The mudroom leads out to a newly renovated kitchen with everything you need to self cater and save on dining out. The dining area is just off the kitchen and seats 6 as well as a sunken living area with vaulted ceilings. Off the living area is a washroom along with a large bedroom with queen size bed. Upstairs you will find the in suite laundry, a full bathroom and a large lofted room with an additional queen bed. This lofted room then leads to another room which has a twin bunk over a double bunk bed that is only suitable for younger children. There is a small balcony with a bbq and seating. This spacious Gables property is the perfect home away from home to enjoy your time in Whistler. Free WiFi, cable and local calls included. You also have one secure underground parking space included. A guest parking pass for one additional vehicle is available on a first come first serve basis. Guests must be 25 years of age to make a reservation and must provide ID at check-in. Harmony Whistler retains the right to refuse access to any property if this condition has not been met and no refund will be provided. NO GROUPS.. Prior to check-in, guests will be required to provide a credit card plus photo identification for a pre-authorization of $750. The credit card may be charged up to $750 after departure if property is damaged, requires excessive cleaning, or if items are missing. The credit card provided must be in the name of main guest. This exceeded our expectations! Clean, convenient and comfortable! We're so glad you enjoyed your stay and the features of this property! For you next stay, we have plenty of units with private and common area hot tubs. We look forward to hosting you again! Thank you for staying with us at The Gables Gregory and leaving us a lovely review. We hope to see you again. We have stayed in almost every lodging property in the Whistler Blackcomb area spanning 35 years. Gables is always a favorite due to terrific location, and this unit is very well equipped and quite comfortable. Only issue with Gables would be for people who don't want to walk up stairs. Otherwise, go for it. Excellent accommodation near the village. Thank you for the great review, we look forward to hosting you again soon ! We loved this property ! It had all we needed to live cheaply and save our money for activities though we did treat the family to a few nights dining out over the week. How can you not with all Whistler has to offer !! So spacious compared to the general hotel rooms. Was great to be able to stay up later than the kids early bed time without worrying to wake them. You can clearly see that it's one of the best locations in Whistler being so close to both the main village and the upper village. We really appreciated the second car park too having two cars in the group. Perfectly warm weather enhanced everything Whistler has to offer. Would stay here again for sure ! !